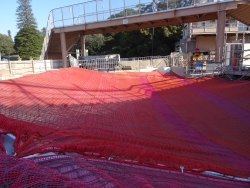 These nets have been designed for Tweed Shire Council for the building of the new bridge at Kingscliff, NSW. The nets are Certified Fall Arrest Safety Nets and were manufactured to EN Standard 1263:1. The net mesh size was 60mm x 60mm x 5mm UV treated polypropylene and attached with the use 10mm SC/GZ wire cables, deadends (heliforms), M20 turnbuckles and 10mm S/S snap hooks. Here we are at the Melbourne Safety in Action Show with our Stand E30. What a great few days this was and plenty of feedback regarding the various safety applications for the construction industry with regard to netting. 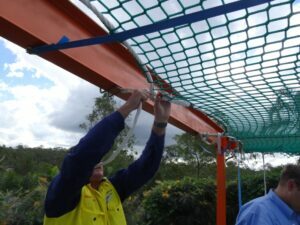 If you have thought about erecting safety nets on your construction, marine or mining site and are in Melbourne this week (17-19) – Tuesday, Wednesday, Thursday, pop in and speak to our dedicated team about the benefits of our safety nets. Our net suppliers from Tecnologia Deportiva in Spain are accompanying us on our stand. 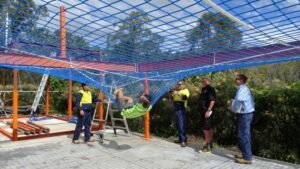 We have recently been involved with the consultation and installation of a very large safety net in one of Central Queensland’s mine sites. The fall arrest safety net was approximately 20m x 14m and we made this with a debris net overlay. The installation of the net on the steel structure was made possible with a crane hoisting the net up and over the steel structure. David Sullivan consulted on this project and in conjunction with a team of riggers and the crane installed the safety net. Another great fall arrest competent installation training day with workers from New South Wales, Queensland and Auckland. New Zealand are on board with their new legislation compulsory for all residential home to be fitted with fall arrest safety nets. As we speak, Australia and New Zealand are forming a Safety Net Association which will be operating in the next few months. This will be a great benefit to the building industry. Safety nets are also recognized in Australia now and we will probably see that this will be compulsory in the coming months. NSW Sugar Refinery are now using the fall arrest nets and two of their rigging staff and one safety officer attended this training day. This project was completed in August 2013 for John Holland Group. The safety nets were manufactured at our warehouse for the TTB Shaft on the VAPS project at the Opera House with David present at installation. 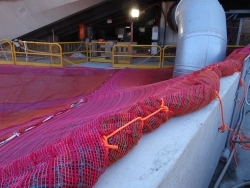 The certified safety net was a 60mm x 60mm x 5mm UV treated knotless polypropylene mesh with a red debris mesh overlay. Our Work Platform Safety nets were used while the construction of the new Grandstand Roof was being undertaken at Randwick Racecourse, Sydney. These nets provided a very safe and stable working platform at height with the ability to be tied around beams and support structures effectively. Because walk on platform nets are a second restraint they need to be worked in conjunction with a safety harness. 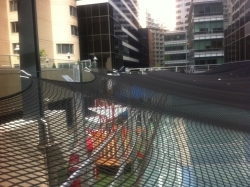 Walk on platform safety nets are an increased safety margin at height, are a cost effective suspension solution and are easily transportable and installed. Problems with Glass Awnings being broken? We’ve got it covered. View the safety nets we have installed over the glass awnings to stop bottles being thrown onto the glass and breaking them. Safety not only for the glass but to protect the children and workers at the Creche underneath. This was a job we recently completed for McBryde Corporation at the BMA-Goonyella/Riverside Mine showing our safety net in action on one of the coal mine conveyor belts. McBryde’s investment in our fall arrest safety nets have proven to be a success as you will see in the pictures below. 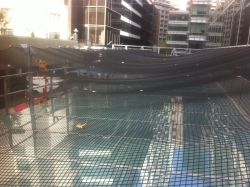 Our work platform safety nets have been installed by a global company Taiyo Birdair Asia in Singapore, these nets will be used to access the structure, in conjunction with static lines while workmen are installing waterproof membrane. Over the last few weeks we have been manufacturing conveyor belt nets for McBryde Corporation Pty Ltd to ensure safety is paramount for workers in the coal mine. Our conveyor belt safety nets have been installed along the conveyor belt to stop any coal from falling.